The Genet Reclining Living Room Group by Best Home Furnishings at Best Home Furnishings in the St. Louis, Chesterfield, St. Charles, MO & Waterloo, Belleville, Edwardsville, IL area. Product availability may vary. Contact us for the most current availability on this product. You've heard of love at first sight, but what about love at first sit? 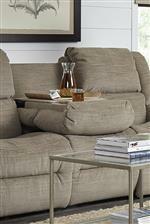 This reclining collection provides the plushest, most welcoming comfort that you can imagine. Overstuffed pillow padding envelops all angles of this sofa. But what truly sets this collection apart is the power recline and power tilt headrests for more comfortable TV time. For the home theater area, this collection offers even more functionality features like a sofa with drop-down tray table and built-in charging capability for devices with USB. To make this ultra-cozy sofa the perfect fit for any space, its available in any of our fabric or leather choices. Leather model includes nailhead studs on the arms to add some timeless sophistication to this look. The Genet collection is a great option if you are looking for Casual furniture in the St. Louis, Chesterfield, St. Charles, MO & Waterloo, Belleville, Edwardsville, IL area. Browse other items in the Genet collection from Best Home Furnishings in the St. Louis, Chesterfield, St. Charles, MO & Waterloo, Belleville, Edwardsville, IL area.